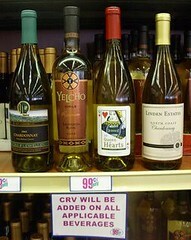 You may remember, a few months ago we discovered a whole wall of 99 cent wine at the 99 Cents Only store in Bellflower. The Chef struck white liquid gold at his local 99.99c only Store yesterday; an abundance of wine "Deals of the Day". There are 5 different white wines to choose from right now -- Reviewed white wines are: Yelcho, Chilean Sauvignon Blanc - Queen of Hearts, Los Alamos Chardonnay - Linden Estates, North Coast Chardonnay - Thirsty Fish, Central Coast Chardonnay. Click the link to watch the video and see how the tasting went.